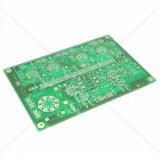 Bare PCB's for Power Amplifiers. DAC - Elvee's Circlophone© Power Amplifier - PCB Overview: Circlophone© is ..
LM3886 Amplifier - PCB This is the bare gold plated PCB of a high power amplifier, based on TI.. The Tubelab SPP (Simple Push Pull) Power Amplifier - PCB Overview: The Tubelab SPP (Simple Pus..